Level Legs | Tennessee Aircraft Services, Inc.
With a fairly new design airplane like the Corvalis, we expect owners and mechanics to frequently learn new things about their planes . The reality is the older planes have a lot of new owners and a lot of new inexperienced small airplane mechanics. Everyone seems to be either learning new stuff or old stuff. Continuous training is, or should be, a reality for everyone. A mechanic new to a particular model airplane must look for anything out of the ordinary even though he/she may not be fully aware of what is ordinary. The 210 is one of those “old” airplanes with a lot of “new” mechanics working on them. The landing gear system has several items that rarely come to light but can be expensive if not caught early. The Cessna 210 Series Service Manual (Rev 5) Section 5 paragraph 5-291a describes the first steps in rigging the landing gear. It starts with setting the height of the gear legs by installing shims under the main gear support. The minimum shim thickness 0.025”. Figure 5-48 has 4 sheets and shows these parts in more detail. Item #10 is the shim(s) and the support block is item #3. The process is pretty simple; measure the distance from some point under the wing to a given point on the gear leg and see if the left and right are within 1/4”. It really doesn’t matter what point is used under the wing as long as it is precisely repeatable on both sides. For the gear leg end, a point as far out from the cabin as practical will yield better precision due to the geometry of the gear mounting. 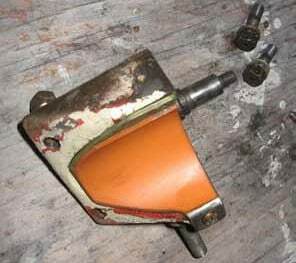 We had the wing fairings removed so the lower wing attachment was used as the reference point and the top ankle bone attach bolt on the gear end. This measurement method is a proper method to use on the fixed gear planes as well. These measurements are only useful when performed with the plane on jacks and the landing gear held securely in the down position by hydraulic pressure. One must resist the temptation to determine gear leg position by measuring from the wing tip to the floor. Typically uneven concrete floors and unbalanced fuel levels thwart any change for an accurate assessment of gear leg position. In our case, the difference between the right gear and the left was just over 1/2” with an unknown shim on the right support and no shim on the left. Cessna sells shims in thicknesses of 0.016”, 0.025”, 0.050”, and 0.071 with the maximum combined installed thickness of 0.075”. Adding a shim lowers the support block which in turn lowers the gear leg which ultimately makes the wing on that side of the plane higher off the ground when the plane is on its wheels. We installed a 0.025” shim first and got the difference down to 1/4”, within tolerance but why not get it closer while we’re there? We installed a 0.071” shim and got the difference down to just under 1/8”. That’s as close as we can get without removing the other support block. Now that we’ve changed the down position of the gear leg we have to adjust the down lock engagement as well. Knowing this would be important, Cessna thoughtfully included that procedure as the very next steps in the service manual. A few gear swings to ensure all is working well and back down on her feet she goes. A 3/8” change at the left wheel should make a noticeable height change at the wing tips. Access to all the block mount bolts requires removing the middle seats and the aft cabin door post inside cover panel. On the P210 series this cover panel is part of the pressure vessel and will require some extra effort to remove. It will also have to be resealed when put back on. The entire job will take 3 hours if you live on fantasy airport. Five or six hours is the norm at most airports. Add at least an hour or two for the pressurized models. There are several lessons one could take away from this event: First – detailed knowledge of the make and model is very helpful. Someone new to this type might not have understood the importance of watching all the different points of interest on the landing gear. Third – access to, and usage of, the proper service manual is not only needed but required by FAR. Without consulting the service manual none of the required maintenance procedures and limitations would be followed. In this case, a very real possibility of the down lock not engaging properly was averted. Read that as very inexpensive insurance.